The magician offers to teach the audience a simple card trick. To make it easy to see, he uses a fan of 3 jumbo playing cards. Two of the cards are red sevens while the middle card is a black seven. The backs of the cards are shown and it is seen that the middle card (the black seven) has a sticker on the back. The magician says this makes it easy to keep up with the black seven. When the marked black seven is removed from the fan, it is seen to have changed to a black jack. The performer then explains how using a partial card flap to cover the jack did the trick. Most of the audience and magicians will realize this is just the old 3 card monte trick using a flap that is in every kid's magic set. 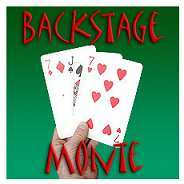 After the magician is through explaining the effect, he/she takes the black jack used in the trick (it still has the sticker on it, proving it is still the same card). The magician then declares "Real magicians don't need to use a card flap to make a card change." 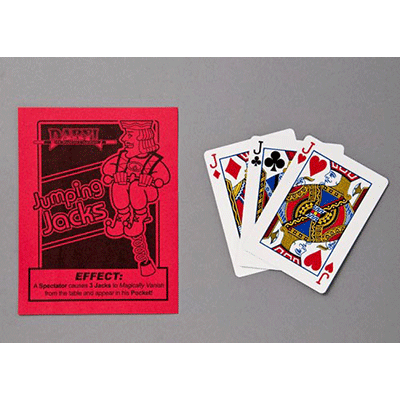 He blows on the card and it instantly changes into a red ace or any other previously selected playing card! This card can be tossed to the crowd for examination. It still has the sticker on the back!! Even magicians will be stunned to see this final unexpected change. Yes, this has fooled many a magician and now the secret can be yours.